The slightly scuffed wall of the Melbourne Break Room. 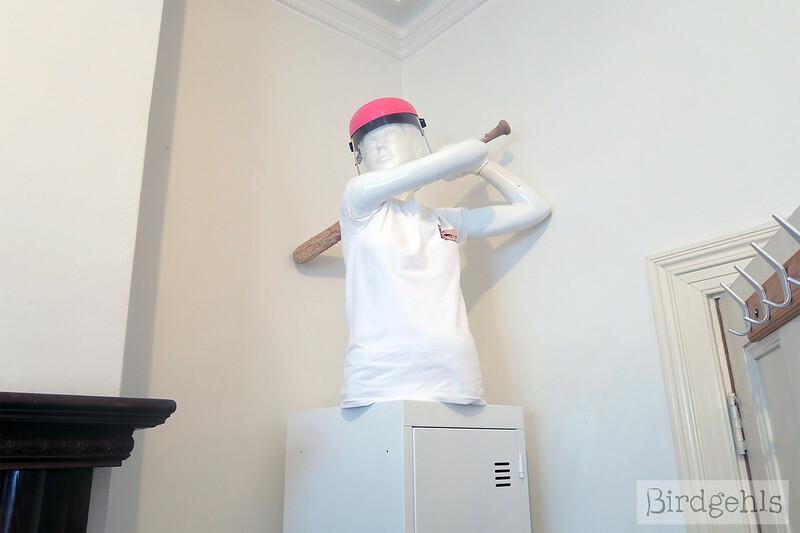 What if I told you that there is a place in Melbourne that will put a helmet in your head, stick a baseball bat in your hand and allow you to smash things in a self-contained room, accompanied by the music of your choice? Would you believe me? As I’m not lying, not one bit. What exactly is The Break Room in Melbourne? Can I go there alone? What should I wear and bring to the Break Room? Where is it, when can I go and how much does it cost? 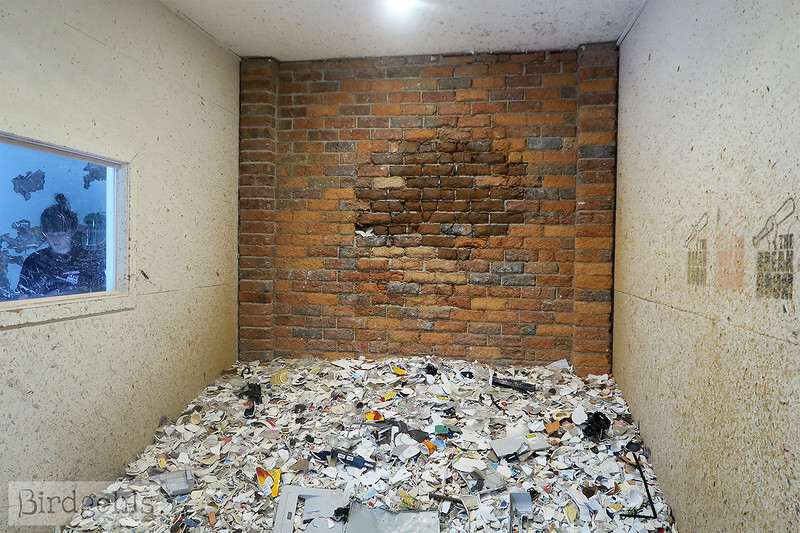 These sort of spaces exist in places around the world, also known as anger rooms. 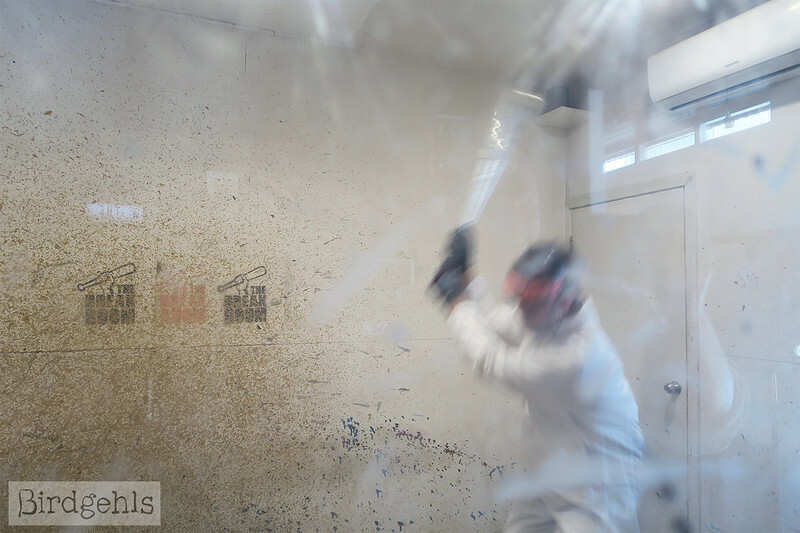 They allow groups or individuals to either use their own carefully selected items (or bring their own) and spend up to twenty minutes smashing the bejeebers out of them, in a controlled environment. It’s quite good fun and possibly cheap therapy. When you get to the Melbourne Break Room, you’re given a thorough safety introduction. A lot of it is common sense, such as “Don’t try to make snow angels on the piles of broken crockery and glass in the room”. I feel this is self-explanatory. You then sign a waiver, stating that if you do choose to make snow angels in the scraps, you do so at your own liability. From there, you’re outfitted with a pair of white overalls and led through to the rooms. Each person gets a crate of items to smash, all of which are sourced locally from Op Shops. There are add-ons you can buy, such as a crate of larger items, or assorted ornaments and old electronics littered around the establishment. We added on a crate of larger items, which cost another $45, but as it was shared between four people, didn’t amount to much more of an expense. You can also bring your own breakables and the team will handle the disposal. They may charge a small fee for larger items. Only one person is allowed in the room at a time, but if you’re in a group, you’re allowed to watch the smasher through a viewing window. You are given thick gloves and full face protection. You select a playlist of choice (I went with my favourite dark classical music playlist on Spotify, which begins with Danse Macabre – you may recognise it as the intro song to the old British crime series of Jonathan Creek), grab the baseball bat that speaks to you best and enter the room. The fun begins as you start smashing your way through the items in the crate! 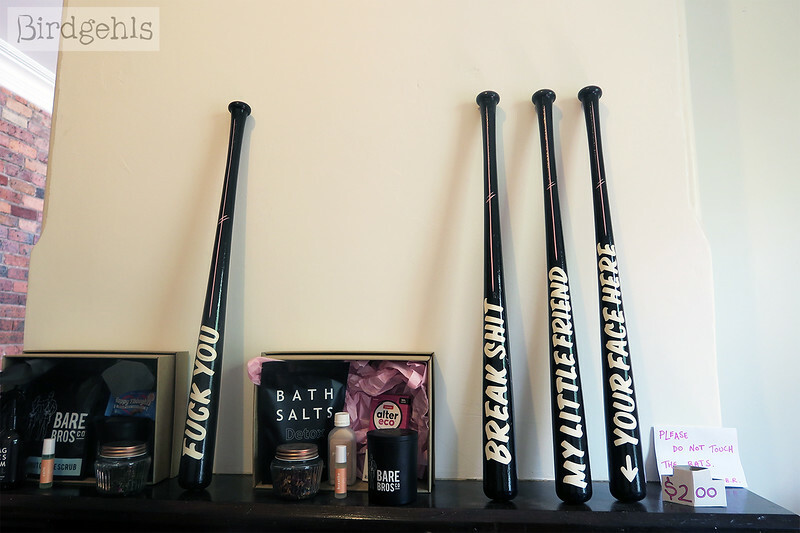 You can throw them up in the air and take a swing with the baseball bat, trying your best to hit them. Others are fun to just hurl straight at the wall, particularly if they’re larger items. If you run out, there are plenty of remnants of things littering the floor that you continue breaking. You could even just smash random sections of the pile of breakables, with your bat. When you’re done or the twenty minutes are over, you exit the room feeling calm, cool and collected… like you’ve really worked through something during your time in there. You can even buy a special bat for the occasion. So, I asked the staff on hand a few questions before I went in. They pointed out that very little of what is donated to charity and Op Shops goes on to get sold. They’re generally drowning in donated items and so many end up being disposed of by the shops, to rot in away in landfill. 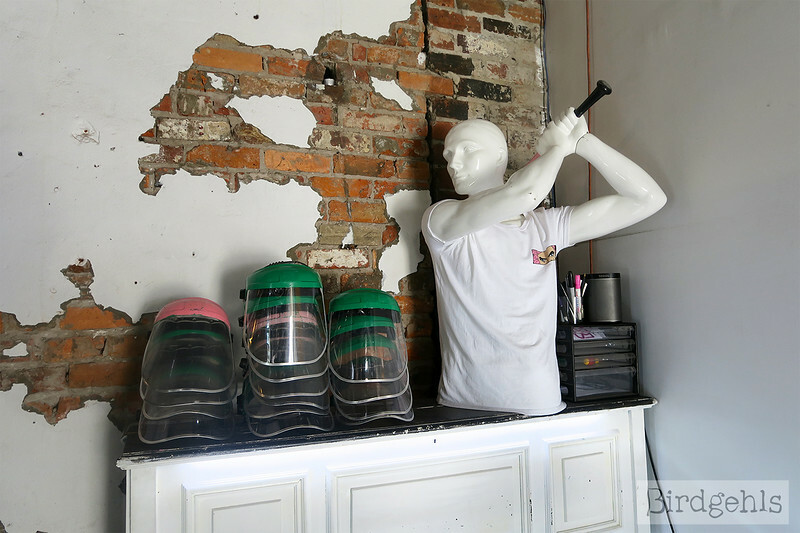 The way they see it, by taking these unwanted items to The Break Room, they’re giving them a second life and helping the local shops shift some of their unwanted items. They empty the rooms out about once a month (what you see in the pictures in this post is about three week’s worth of breakables) and would take what was left out to the tip. However, they’ve just started working with an environmental group to repurpose the breakables into material which will be used to build roads. They’re also salvaging metal from the scraps to be melted down and reused. Who says sustainability can’t be smashing good fun? Make your rage target specific. Yes! The Break Room in Melbourne accepts group and individual bookings. There are two rooms to break stuff in. One is better suited for more people, as it has a viewing window. However, the second down the back is much more isolated. Groups can stand and watch at the door, or someone attending the rooms alone could be granted utter privacy during their twenty minutes in the room. In terms of clothing, they require enclosed shoes. It’s a bit more ideal to wear thicker-soled shoes, such as boots (Doc Martins would be quite ideal in this situation). Others such as Converse and Vans don’t have thick soles and although you’ll probably be fine, there is a small risk of stepping on a rogue piece of glass and having it pierce through the shoe. In terms of clothing, you will be wearing the protective overalls. However, it’s best to wear long pants underneath. Leggings are fine. Perhaps don’t do what one guy we saw there did and strip off your t-shirt before putting the overalls on. He was covered in sweat and I can’t imagine that would’ve been pleasant for the next person who had to don that same pair. Pongy or what? 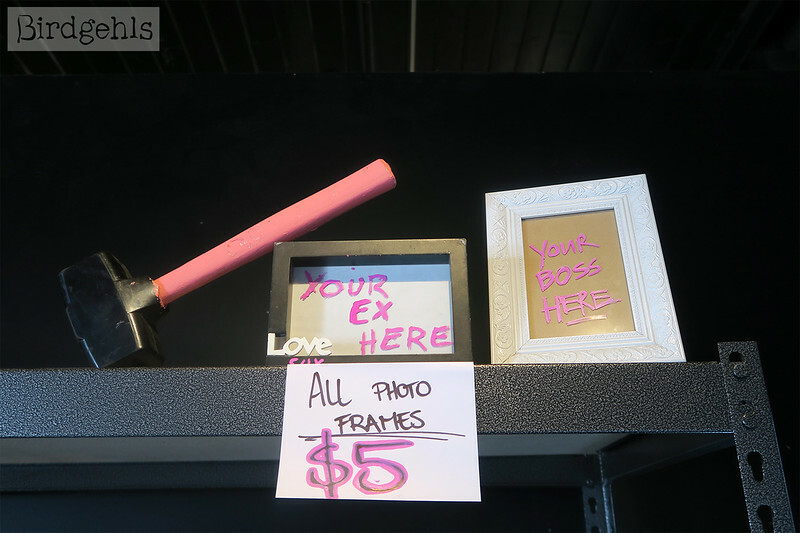 In terms of what to bring to the Break Room… you can take along any props of your own that you fancy smashing. I would have a song choice floating around in your head so you can get right down to it. And bring a lot of enthusiasm! Just some creepy Collingwood art. 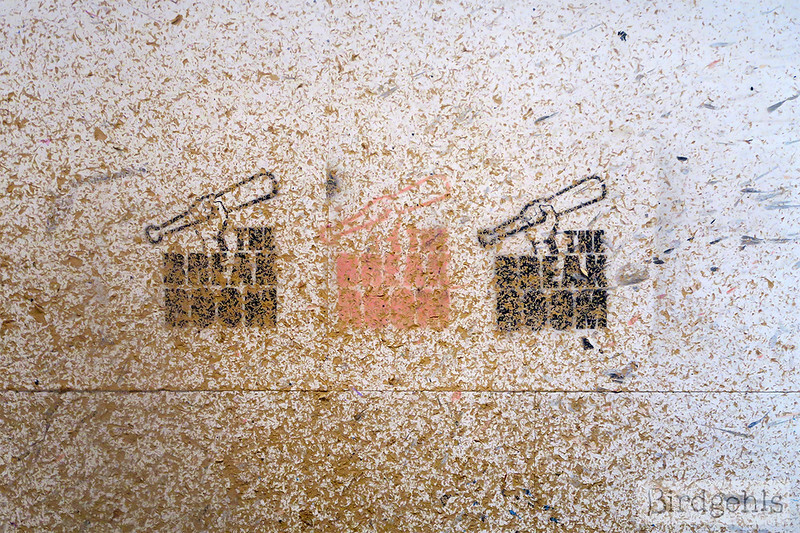 The Break Room in Melbourne is located at 29 Budd St in Collingwood. It’s closed Tuesdays and Thursdays, open from 6:30pm on Monday, Wednesday and Friday and from 11am to 10pm on the weekend. Individual bookings start at $50, but they offer discounts for groups. See more booking options here. It’s a lot of fun and I highly recommend checking it out. I think it would make a great option for a rendezvous with a special someone (or an ideal place to head to straight after a breakup). 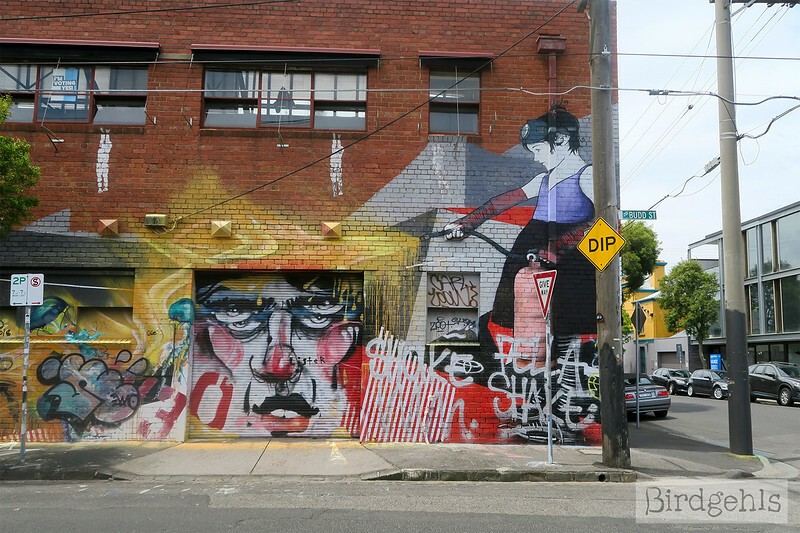 You can check out some other quirky date options in Melbourne here. 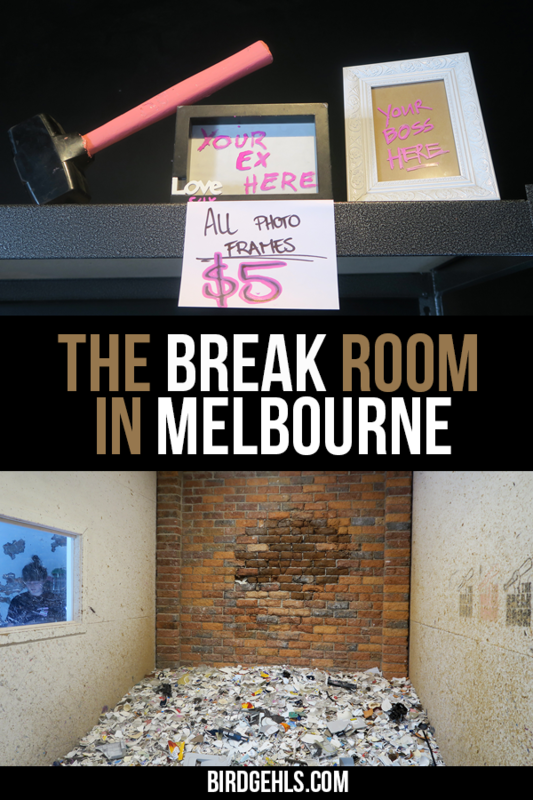 Have you been to the Break Room in Melbourne? Did you have a smashing good time?